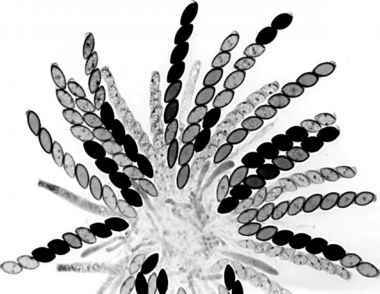 Figure 5.4 Opened perithecium of Neurospora crassa. Photomicrograph of a rosette of maturing asci from a cross of wild-type (+) X cys-3 mutant (m) allele that affects cysteine biosynthesis and results in unpigmented (white) ascospores. Because the final division is mitotic, contiguous sister ascospores have the same genetical constitution. One ascus at top center and two asci at upper left show four black : four white firstdivision segregation. The remaining mature asci show second division segregation patterns (2+, 2m, 2+, 2m) resulting from crossing over between cys-3 and centromere. Photo courtesy of Namboori B. Raju. while the superscript "+" is used to distinguish the wild allele from the mutant allele). In a cross of a wild N. crassa with pink-orange carotenoid pigment, i.e., al+ and aerial mycelium (col+) to a double mutant albino (white, impaired in carotenoid biosynthesis) and colonial (restricted growth in the form of a colony), four types of progeny are produced in equal proportion: al+ col+ (wild type with orange, aerial mycelium), al col (albino colonial), al+col (pink-orange colonial) and al col+ (albino, spreading mycelium), in conformity with Mendel's Second Law of Independent Assortment. 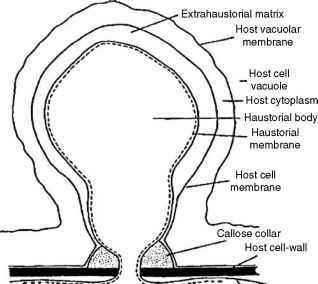 From a Neurospora cross, a significant number of sexual progeny can be grown in small tubes and analyzed in about four weeks, providing considerable savings both in space and time than would be possible with either a pea plant or a fruit fly. Neurospora has been the main source of information about the basic recombination mechanisms in eukaryotes. It is an ideal classroom material for teaching of microbiological and genetic methods.